Cells and cytokines responsible for physiological OC renewal. OC precursors may differentiate from the population of monocytes/macrophages, among which they circulate by virtue of their expression of the receptor RANK. When RANKL binds to this receptor in the presence of the trophic factor M-CSF, which in turn binds to its receptor, colony-stimulating factor receptor 1 (c-Fms), OC precursors differentiate and fuse together to form mature, multinucleated bone-resorbing OCs. 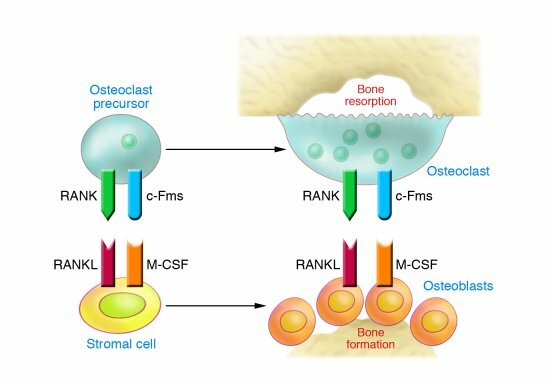 Under physiological conditions the dominant source of RANKL and M-CSF in the bone marrow microenvironment is from the bone-forming cells, the OBs, and their SC precursors.